Twelve Type 97 Heavy Bombers (Allied code name of Sally) carrying commandos from the Giretsu Airborne Unit took off from Kengun Airfield in Kumamoto Prefecture in the early evening of May 24, 1945. Eight aircraft headed toward Okinawa's Yomitan (Yontan) Airfield, and the destination for four aircraft was Kadena Airfield. The entire operation included 136 commandos and 32 pilots and other aircraft crewmen from the 3rd Dokuritsu Hikōtai (Independent Air Squadron). The name of giretsu (義烈) means "strong loyalty." Four aircraft had to return and make forced landings due to engine trouble or other reasons. Only five of the remaining planes reached Yomitan, and only one of these successfully landed with the others crashing. The commandos in this one plane destroyed American planes and supplies at Yomitan Airfield until they were killed. Already evening on May 24, 1945, at the Okinawan battleground where there was a likely defeat, several bombers made an exceptional crash landing at Yomitan (Yontan) Airfield. Soldiers who were fully prepared for death leapt out of the aircraft, fired at numerous enemy planes and supplies of fuel and ammunition at the airfield, and turned it into a scene of chaos. As a result, the airfield was not operational for three days, and during this period of time our aerial special attack aircraft achieved great battle results against enemy ships. 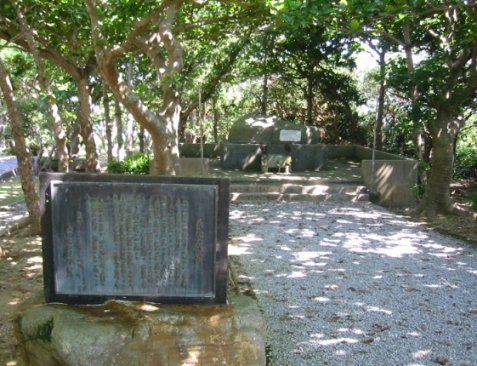 In an heroic mission, 113 officers and men of the Giretsu Airborne Unit, selected from the 1st Raiding Regiment and the 3rd Dokuritsu Hikōtai (Independent Air Squadron), gave their lives here for an eternal cause. Believing in those who would continue afterward, they became the foundation for protection of the Japanese people. We want to provide support to the spirits of these officers and men. The back of the bronze tablet has engraved the names of the men of the Giretsu Airborne Unit who died in battle. The white plaque on the Giretsu Airborne Unit Monument's front side has information about the monument. 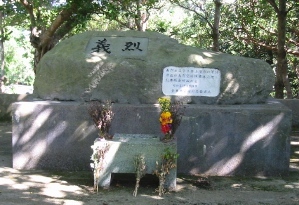 The characters of giretsu (義烈) on the monument are in the handwriting of Unit Commander Okuyama in his farewell letter. The monument stone is from Mount Kinbō in Kumamoto Prefecture, from where the Giretsu Airborne Unit made its sortie on May 24, 1945. On the right side of the path to the monument there are two paintings, one of the departure at Kengun Airfield and the other of a young man of the Giretsu Airborne Unit who is writing his last letter. 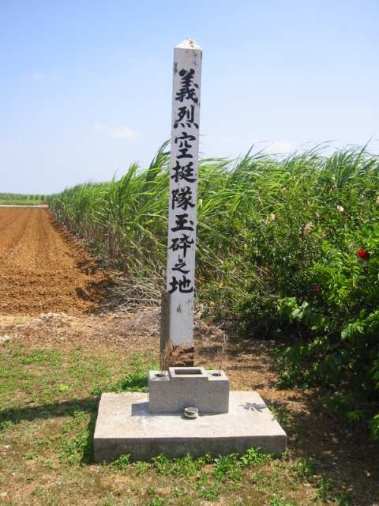 Yomitan Village, about 45 kilometers north of Mabuni Hill, has a white post to mark where the members of the Giretsu Airborne Unit died in battle at Yomitan Airfield (see photograph below). There is an annual memorial ceremony held in front of the Giretsu Airborne Unit Monument on the Sunday nearest to May 24. Mabuni Hill also has the 19th Hikō Sentai Special Attack Monument to remember 16 Army Type 3 Hien Fighter (Tony) pilots who died in special (suicide) attacks.